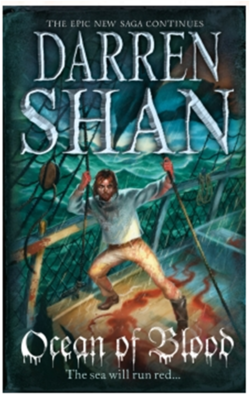 Ocean of Blood - Darren Shan Wiki - The wiki about all Darren Shan books! Free from their mentor Seba Nile, Larten Crepsley and Wester Flack join the Cubs -- wild young vampires with little respect for human life and a taste for mindless enjoyment. For the Cubs, everything is easy. But nothing has ever been easy for Larten, and soon fate throws his life into another spin. With dark paths to travel, Larten finds himself far from the Vampire Mountain and its rules. A long way from home, sick and alone, he must decide what kind of vampire he will be. Whether he will stand firm, be true to his master and his principles -- or whether he will lose himself in blood. . . . This book was originally named Quicksilver, as the author wanted to name the books on the basis of what Mr. Crepsley was called at that time. Mr.Crepsley is nicknamed Quicksilver because he shuffled cards so fast Tanish and his friends thought his hands were like Quicksilver. This page was last edited on 26 September 2012, at 13:59.